Some of the many firearms surrendered during the 2017 amnesty. Photo: ACT Policing. Police have commended regional and metropolitan communities for their response to the recent Firearms Amnesty across New South Wales. 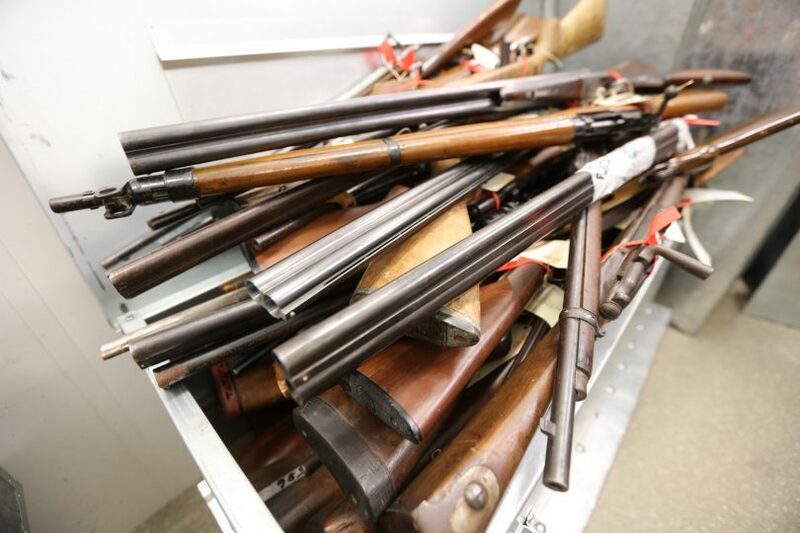 An extraordinary collection of weapons has been surrendered, including 48 firearms from the Monaro Police District and 22 from South Coast Police District. In total, more than 8300 guns including 413 shotguns and 1373 rifles, along with more than 74,000 rounds of ammunition, 56 prohibited weapons, and 338 firearm parts and accessories were surrendered. The NSW Firearms Amnesty ran from July 1 to September 30 with the aim of reducing unregistered and unwanted firearms in the community. During those three months, people were encouraged to legally dispose of unregistered firearms or firearm-related items without penalty. Metropolitan Field Operations Deputy Commissioner, Jeff Loy, says the community clearly demonstrated it does not want firearms falling into the wrong hands and putting lives at risk. “There has been a really strong response across the state and it is encouraging to see community members recognising the danger posed by these weapons and doing the right thing by handing them in or having them registered,” Deputy Commissioner Loy says. Lake Illawarra Police District with 70 firearms. “Police have successfully captured thousands of firearms, either for destruction or registration including a replica colt AR-15 machine gun, .36 colt 1851 navy six chamber percussion revolver and eight .303 Lee Enfield bolt action repeater rifles. “It is of course concerning that these potentially dangerous weapons were once on our streets; however at the same time, I commend the community for helping us remove them and to ultimately make our neighbourhoods safer,” Mr Grant says. More than 8300 guns – including 413 shotguns and 1373 rifles – have been surrendered to police and dealers as part of the state-wide Firearms Amnesty.Metropolitan Field Operations Deputy Commissioner Jeff Loy will be joined by Minister for Police Troy Grant to wrap-up the state-wide amnesty which follows the success of a national campaign in 2017, aimed at reducing unregistered and unwanted firearms in the community.The NSW Firearms Amnesty which ran from 1 July to 30 September saw more than 74,000 rounds of ammunition, 56 prohibited weapons and 338 firearm parts and accessories surrendered, with the public encouraged to legally dispose of unregistered firearms or firearm-related items without penalty.Deputy Commissioner Loy said the community clearly demonstrated it does not want firearms falling into the wrong hands and putting lives at risk.“There has been a really strong response across the state and it is encouraging to see community members recognising the danger posed by these weapons and doing the right thing by handing them in or having them registered,” Deputy Commissioner Loy said.“Too many firearms are not stored correctly which makes them an easy target for thieves, particularly in regional and rural properties,” Deputy Commissioner Loy said.Across the state the top five districts where firearms were surrendered to police included Murray River Police District with 128 firearms, Oxley Police District with 93 firearms, The Hume Police District with 88 firearms, Mid North Coast Police District with 79 firearms and Lake Illawarra Police District with 70 firearms.Minister Grant said the amnesty said was an opportunity to reduce the number of unregistered guns on the street without being penalised.“We are absolutely focused on doing everything we can to keep people safe, and this amnesty has allowed police to significantly reduce the number of unregistered firearms in the community,” Mr Grant said.“Police have successfully captured thousands of firearms – either for destruction or registration – including a replica colt AR-15 machine gun, .36 colt 1851 navy six chamber percussion revolver and eight .303 Lee Enfield bolt action repeater rifles.“It is of course concerning that these potentially dangerous weapons were once on our streets; however – at the same time, I commend the community for helping us remove them and to ultimately make our neighbourhoods safer,” Minister Grant said.Anyone who has not registered or disposed of a firearm or firearm-related parts during the amnesty could now face a hefty penalty.During the amnesty more than 250 dealers participated and are expected to hand over firearms submitted to them by mid-November. Police say anyone who has not registered or disposed of a firearm or firearm-related parts during the amnesty could now face a hefty penalty. More than 250 gun dealers participated in the amnesty. They are expected to hand over the firearms submitted by mid-November. A REPLICA “Colt AR-15 machine gun” huh? Such a thing does not exist. In any case, this type of amnesty should be open all the time. Most of them net old guns that don’t work, found in sheds, that people never knew were there. Making it difficult to get rid of them any time outside of an amnesty makes no sense at all. Also, a lot of baby-boomers (the evil ones that own all the rental houses) are handing in their rifles and shotguns they have held legally for most of their lives. The paperwork that is involved to transfer them to others in their family is simply too hard to handle and few young people do not have the time or discipline to take up sporting shooting anyhow.